Pharma validation and verification is a part of GMP and considered as an important part of pharmaceutical documentation. 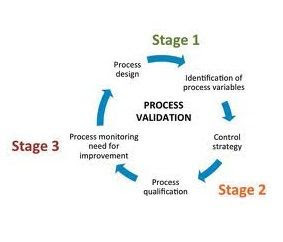 Validation is an essential part of good manufacturing practices (GMP). It is, therefore, an element of the quality assurance programme associated with a particular product or process. The basic principles of quality assurance have as their goal the production of products that are fit for their intended use. • Quality, safety and efficacy must be designed and built into the product. • Quality cannot be inspected or tested into the product. • Each critical step of the manufacturing process must be validated. Other steps in the process must be under control to maximize the probability that the finished product consistently and predictably meets all quality and design specifications. Validation of processes and systems is fundamental to achieving these goals. It is by design and validation that a manufacturer can establish confidence that the manufactured products will consistently meet their product specifications. — validation protocols and reports. • Time: generally validation work is subject to rigorous time schedules. • Financial: validation often requires the time of specialized personnel and expensive technology. (e.g. a multidisciplinary team, comprising quality assurance, engineering, manufacturing and other disciplines, depending on the product and process to be validated). and qualification (e.g. cleaning, computer and computerized systems, equipment, utilities and systems, and analytical methods) are included. 2.1 These guidelines focus mainly on the overall concept of validation and are intended as a basic guide for use by GMP inspectors and manufacturers. It is not the intention to be prescriptive in specific validation requirements. This document serves as general guidance only, and the principles may be considered useful in its application in the manufacture and control of active pharmaceutical ingredients (APIs) and finished pharmaceutical products. Validation of specific processes and products, for example in sterile product manufacture, requires much more consideration and a detailed approach that is beyond the scope of this document. 2.2 There are many factors affecting the different types of validation and it is, therefore, not intended to define and address all aspects related to one particular type of validation here. 2.3 Manufacturers should plan validation in a manner that will ensure regulatory compliance and ensuring that product quality, safety and consistency are not compromised. 2.4 The general text in the main part of these guidelines may be applicable to validation and qualification of premises, equipment, utilities and systems, and processes and procedures. More specific principles of qualification and validation are addressed in the appendices. Semi-automatic or fully automatic clean-in-place (CIP) systems and other special cases should be treated separately. Validation and qualification are essentially components of the same concept. The term qualification is normally used for equipment, utilities and systems, and validation for processes. In this sense, qualification is part of validation. 4.1.1 There are two basic approaches to validation — one based on evidence obtained through testing (prospective and concurrent validation), and one based on the analysis of accumulated (historical) data (retrospective validation). Whenever possible, prospective validation is preferred. Retrospective validation is no longer encouraged and is, in any case, not applicable to the manufacturing of sterile products. • control of process parameters being monitored during normal production runs to obtain additional information on the reliability of the process. 4.2.1 There should be an appropriate and sufficient system including organizational structure and documentation infrastructure, sufficient personnel and financial resources to perform validation tasks in a timely manner. Management and persons responsible for quality assurance should be involved. 4.2.2 Personnel with appropriate qualifications and experience should be responsible for performing validation. They should represent different departments depending on the validation work to be performed. 4.2.3 There should be proper preparation and planning before validation is performed. There should be a specific programme for validation activities. 4.2.4 Validation should be performed in a structured way according to the documented procedures and protocols. — when major changes have been made. 4.2.6 Validation should be performed in accordance with written protocols. A written report on the outcome of the validation should be produced. 4.2.7 Validation should be done over a period of time, e.g. at least three consecutive batches (full production scale) should be validated, to demonstrate consistency. Worst case situations should be considered. 4.2.8 There should be a clear distinction between in-process controls and validation. In-process tests are performed during the manufacture of each batch according to specifications and methods devised during the development phase. Their objective is to monitor the process continuously. 4.2.9 When a new manufacturing formula or method is adopted, steps should be taken to demonstrate its suitability for routine processing. The defined process, using the materials and equipment specified, should be shown to result in the consistent yield of a product of the required quality. 4.2.10 Manufacturers should identify what validation work is needed to prove that critical aspects of their operations are appropriately controlled. Significant changes to the facilities or the equipment, and processes that may affect the quality of the product should be validated. A risk assessment approach should be used to determine the scope and extent of validation required. 5.1 Qualification should be completed before process validation is performed. 5.3 Major equipment and critical utilities and systems, however, require IQ, OQ and PQ. 6.1 Calibration and verification of equipment, instruments and other devices, as applicable, used in production and quality control, should be performed at regular intervals. 6.2 Personnel who carry out calibration and preventive maintenance should have appropriate qualifications and training. 6.3 A calibration programme should be available and should provide information such as calibration standards and limits, responsible persons, calibration intervals, records and actions to be taken when problems are identified. 6.4 There should be traceability to standards (e.g. national, regional or international standards) used in the calibration. 6.5 Calibrated equipment, instruments and other devices should be labelled, coded or otherwise identified to indicate the status of calibration and the date on which recalibration is due. 6.6 When the equipment, instruments and other devices have not been used for a certain period of time, their function and calibration status should be verified and shown to be satisfactory before use. — references to existing documents. 8.1 There should be qualification and validation protocols describing the qualification and validation study to be performed. — predetermined acceptance criteria for drawing conclusions. 8.3 There should be a description of the way in which the results will be analysed. 8.4 The protocol should be approved prior to use. Any changes to a protocol should be approved prior to implementation of the change. 9.1 There should be written reports on the qualification and validation performed. 9.2 Reports should reflect the protocols followed and include at least the title and objective of the study; reference to the protocol; details of material, equipment, programmes and cycles used; procedures and test methods. 9.4 The departments responsible for the qualification and validation work should approve the completed report. 9.5 The conclusion of the report should state whether or not the outcome of the qualification and/or validation was considered successful. 9.6 The quality assurance department should approve the report after the final review. The criteria for approval should be in accordance with the company’s quality assurance system. 9.7 Any deviations found during the validation process should be acted upon and documented as such. Corrective actions may be required. 10.2 All SOPs for operation, maintenance and calibration should be prepared during qualification. 10.3. Training should be provided to operators and training records should be maintained. 10.4 Design qualification should provide documented evidence that the design specifications were met. 10.5 Installation qualification should provide documented evidence that the installation was complete and satisfactory. 10.6 The purchase specifications, drawings, manuals, spare parts lists and details should be verified during installation qualification. 10.7 Control and measuring devices should be calibrated. 10.8 Operational qualification should provide documented evidence that utilities, systems or equipment and all its components operate in accordance with operational specifications. 10.9 Tests should be designed to demonstrate satisfactory operation over the normal operating range as well as at the limits of its operating conditions (including worst case conditions). 10.10 Operation controls, alarms, switches, displays and other operational components should be tested. 10.11 Measurements made in accordance with a statistical approach should be fully described. 10.12 Performance qualification should provide documented evidence that utilities, systems or equipment and all its components can consistently perform in accordance with the specifications under routine use. 10.13 Test results should be collected over a suitable period of time to prove consistency. 10.14 Requalification should be done in accordance with a defined schedule. The frequency of requalification may be determined on the basis of factors such as the analysis of results relating to calibration, verification and maintenance. 10.16 Requalification should be considered as part of the change control procedure. 10.17 Processes and procedures should be revalidated to ensure that they remain capable of achieving the intended results. 10.19 Revalidation should be done in accordance with a defined schedule. 10.20 The frequency and extent of revalidation should be determined using a risk-based approach together with a review of historical data. 10.21 Periodic revalidation should be performed to assess process changes that may occur gradually over a period of time, or because of wear of equipment. 10.23 Revalidation should be performed following a change that could have an effect on the process, procedure, quality of the product and/or the product characteristics. Revalidation should be considered as part of the change control procedure. 10.24 The extent of revalidation will depend on the nature and significance of the change(s). 10.25 Changes should not adversely affect product quality or process characteristics. Changes of equipment which involve the replacement of equipment on a “like-for-like” basis would not normally require a revalidation. For example, installation of a new centrifugal pump to replace an older model would not necessarily require revalidation. 11.1 Changes should be controlled in accordance with a SOP as changes may have an impact on a qualified utility, system or piece of equipment, and a validated process and/or procedure. 11.2 The procedure should describe the actions to be taken, including the need for and extent of qualification or validation to be done. 11.3 Changes should be formally requested, documented and approved before implementation. Records should be maintained. 12.1 Personnel should demonstrate that they are appropriately qualified, where relevant.